CITP [abbr., Controller Interface Transport Protocol] is a communication protocol often used between media servers, lighting consoles, and visualizers. As a media server, MADRIX is sending CITP data and making information available to other devices. For example, MADRIX will not show Thumbnails from other devices. CITP is used between at least two devices [or possibly more]. If you want to use CITP, you need a second device [hardware or software] to actually see the result. You will usually not see the result in MADRIX, but mainly on the other device [e.g., a lighting console or visualizer]. Your second device needs to support CITP. Otherwise, the connection will not work. Moreover, not every product might support all of the features the CITP protocol has to offer. Please refer to the user manual of your other devices to learn more about the features available to you. Showing Thumbnails is a useful feature, when you are using a lighting desk to control MADRIX remotely [for example via »Art-Net Remote]. You may not have direct access to the PC that runs the MADRIX software and thus would like to preview the effects and visuals that you preconfigured. MADRIX generates Thumbnails for every Storage Place [Learn more »Storages]. On the graphical user interface of MADRIX, you have access to a total of 256 x 256 Storage Places. When you hover over a Storage Place with your mouse cursor, you will see the preview image [Thumbnail]. ▪ You can use CITP to display those preview images [Thumbnails] directly on your lighting desk. ▪ Please make sure that MADRIX has created these Thumbnails. Thumbnails are created when leaving [or re-selecting] a Storage Place. If no preview image has been generated for a Storage Place, you will only see a black image for this Storage Place on your console when using CITP. ▪ Important Note: When using CITP 1.0 with MSEX version 1.0 or MSEX version 1.1, you will only be able to use up to 255 Storages and up to 255 Storage Places due to a restriction in the MSEX 1.0 and MSEX 1.1 specifications. While Thumbnails provide a static preview of MADRIX Effects, you may use Streaming to directly preview the Main Output [Preview Output]. MADRIX features three live Preview windows to show your effects. The Main Output [Preview Output] will show the visuals that are sent to your LEDs [Learn more »3 Previews]. You can use CITP to stream, i.e. show, the Main Output [Preview Output] directly on your lighting desk [It will not look like a static image, but like a fluent video.] The maximum frame rate for Streaming via CITP in MADRIX is 10 FPS by default [If you want to capture Streaming with a higher frame rate, you can adjust this frame rate to the Main Mix FPS as described below. The default frame rate is sufficient for operators and usage in combination with consoles.]. Due to the supported file format [RGB8], a maximum of 21,823 pixels can be streamed. Not every product may support this feature. 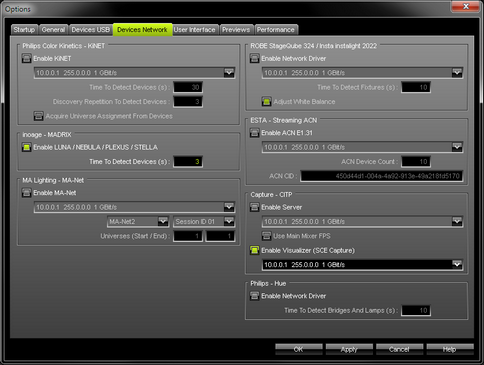 In addition, you can use MADRIX as a visualizer to show the media stream of another CITP server. Instead of streaming the Main Output of MADRIX to another CITP device, MADRIX can receive a stream from another CITP server and show it in MADRIX using the SCE Capture effect. ▪ Devices, that should communicate with each other via CITP, should be configured to be in the same network! ▪ The network protocol of CITP does not have any special restrictions. ▪ Choose your network card from the drop-down list. 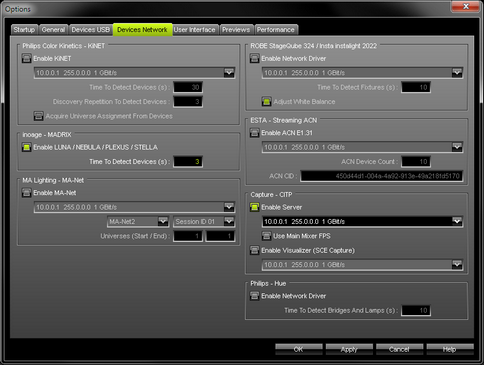 Make sure to select the correct network adapter that will be used for CITP! ▪ No further steps are required to configure MADRIX as CITP server. ▪ Use Main Mixer FPS - Removes the 10 FPS limit for Streaming and couples the frame rate to the frame rate of the Main Mixer of MADRIX. The Main Mixing FPS is 50 FPS by default. ▪ Once CITP is enabled in MADRIX, your lighting console [or any other second device] should be able to find MADRIX in the network. ▪ In order to enable CITP for the device that you want to connect to MADRIX, please consult the user manual of the other device.